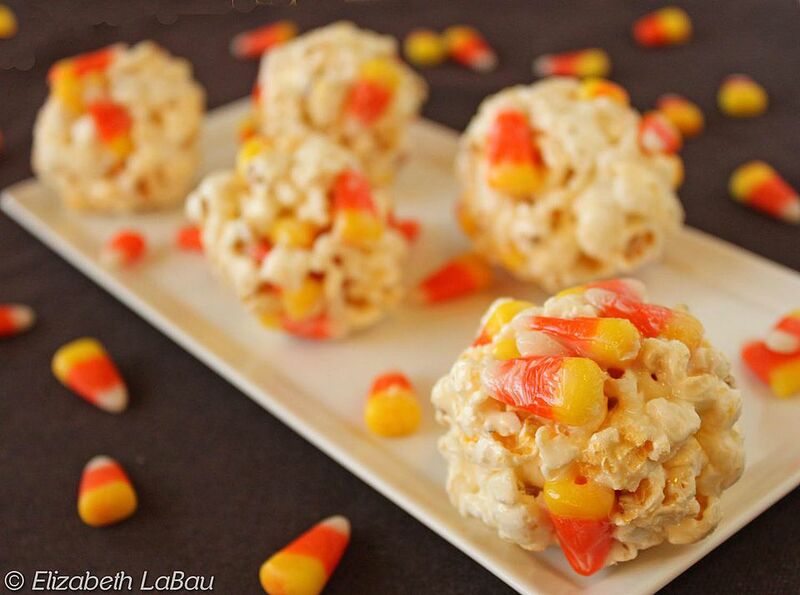 Sweet and chewy, these candy corn popcorn balls are unbelievably easy to whip up for any last-minute Halloween parties. Just melt together marshmallows, popcorn, and candy corn, then press together—it's really that easy. Place the popped popcorn and the candy corn in a large mixing bowl and set aside. Place the butter in a microwave-safe bowl and microwave for 30 to 45 seconds until melted. Add the marshmallows and microwave for an additional 90 seconds to melt them. The marshmallows might not look melted at the end of this time, but once you stir them, they should liquefy. Stir to blend the butter and marshmallows, then add the vanilla and salt and stir again until the candy is well-mixed. Pour the marshmallow mixture over the popcorn and candy corn and stir until they are thoroughly combined. Allow the mixture to sit for a minute, to cool down the hot marshmallow. Spray your hands with nonstick cooking spray and scoop up a handful of popcorn. Press it firmly between your hands, forming a ball shape. Make sure that the balls are compact; loosely-formed popcorn balls easily fall apart. If the balls don’t form at first, allow the mixture to sit for another minute, this seems to help them hold together. Place the popcorn balls on the prepared baking sheet and allow them to firm up at room temperature. Store the popcorn balls in an airtight container in a cool, dry room.